For the Octo Canyon mission with the same subtitle, see Tide Goes Out (mission). Bomb Rush Blush is a song originally performed by Callie. Bomb Rush Blush is a is a fast-paced and exuberant pop song, mirroring Callie's energetic and playful personality. It can be assumed through the title and in-game dialog that the song's lyrics are about Callie using a Bomb Rush, although the actual lyrics are nonsensical. 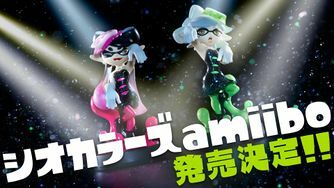 The song was first revealed on 29 April 2016 during the second live Squid Sisters performance at Cho-Ongakusai 2016, alongside Marie's solo song, Tide Goes Out. The following day, it was revealed that the new songs would be unlockable with the newly-revealed Callie and Marie amiibo figures, which were released on 8 July 2016. Scanning them allows the player to watch performances of Squid Sisters songs as if they were in a Splatfest, and Bomb Rush Blush is exclusive to the Callie amiibo. During the performance, Marie simply sits down, while Callie performs her song solo. In Splatoon 2, Bomb Rush Blush can be unlocked to listen in Squid Beatz 2 from the Callie amiibo. The original song however cannot be heard anywhere else in the base game. The booklet included with Splatoon Live in Makuhari gives the official lyrics for Bomb Rush Blush. The lyrics are nonsensical; the Japanese hiragana simply gives the pronunciation. Music videos for both Bomb Rush Blush and Tide Goes Out were released in anticipation of the Callie vs. Marie Splatfest. The Bomb Rush Blush video features Callie dancing on various stages during the nighttime Splatfest theme. The dance is the same one from the Callie amiibo performance. A new version of the song was composed for use in Splatoon 2, where it is credited as a DJ Octavio song, with Callie as a featured artist. Production-wise, it is almost completely different, functioning more as an original song with samples from Bomb Rush Blush. It starts off with a modified intro before transitioning to a brand-new electronic dubstep composition. It also interpolates the melody from the Onward! jingle heard after beating a mission, which was also interpolated in I Am Octavio. During Splatoon 2's final battle (in which the subtitle of the mission is named after the song), Agent 4 arrives to meet a brainwashed Callie, who is revealed to be working with DJ Octavio, who brags about how he "remixed" Callie's brain, and in addition, her song. Together, they perform the song as they battle Agent 4, with Callie using Bomb Rush Specials with oversized gold Splat Bombs to coincide with the song. The song plays during the first two phases before it changes to Tidal Rush for phase three. The song Tidal Rush by DJ Octavio, featuring Callie vs. Marie, is an extensive remix of both Octavio's Bomb Rush Blush remix and Marie's Tide Goes Out. In Super Smash Bros. Ultimate, a new remix of Bomb Rush Blush was made. It has an electronic style, not too dissimilar from the DJ Octavio remix. It was arranged by Tomoya Ohtani of Sega and utilises the Amen break, a heavily sampled drum track that is frequently used in Sonic soundtracks. In Splatoon 2, although the song is presumably about the Bomb Rush which was removed in the game, a jingle playing the melody of Bomb Rush Blush can be heard whilst using the Bomb Launcher. However, it is only noticeable in Recon mode due to all the interfering noises in multiplayer battles. There is a short motif of Callie singing Bomb Rush Blush in Fresh Start. The Plan samples the segue from the introduction to the main part of the DJ Octavio remix of Bomb Rush Blush. The same section is also sampled in Splattack! (Octo). During the fight with Callie, she says through dialog what is implied to be the lyrics of the song. During the first play-through, she sings: "♪Blushing faces covered in pink!♪ ♪Rushing bombs, exploding ink!♪". Replaying the level again has alternative dialog, in which she sings "♪Faces blush, a rush of ink!♪ ♪Bombs explode, no time to think!♪"
The DJ Octavio remix of Bomb Rush Bush and Tidal Rush are both the first, and currently only instances of songs with featured artists in the series. Bomb Rush Blush references the Bomb Rush Special weapon from Splatoon. This page was last edited on 12 April 2019, at 13:35.